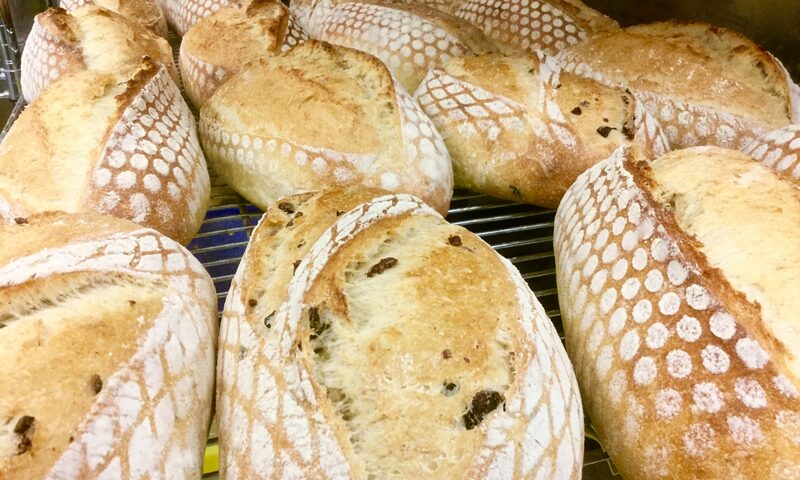 Today’s bake was, again, from The Bread Baker’s Apprentice . As I had about 9 ounces leftover of the biga used in the Potato Rosemary bread, I decided to use it up for another loaf before it’s three days expiry ran out. 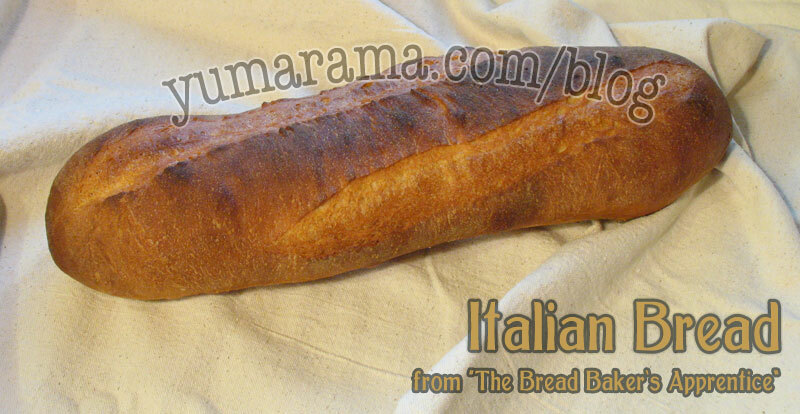 Looking through the BBA, I saw a recipe that I could use it up with and decided on Italian Bread. I also saw that it was one of the doughs you could use for Grissini, Cool, two breads in one shot! So I made up a batch. Once more, this was strictly following the recipe being my first time through. Made up the dough which was enough for two loaves, however, I made only one into a batard shape and the rest I rolled out and cut into breadsticks. By now, you’re probably pretty familiar with what a normal bread dough looks like so I’ll spare you that bit, but here’s the breadsticks, waiting for the loaf to come out of the oven so they could go in for a bake. I simply took the dough and rolled it out to a size about as wide as the pan, then using a pizza wheel, cut small strips about 2cm wide. I rolled them up a little so they wouldn’t look like small planks, spread them on the sheet and sprinkled a mix of coarse black pepper, paprika and a little garlic powder on half, sesame seed on the other then a little coarse salt over the lot. 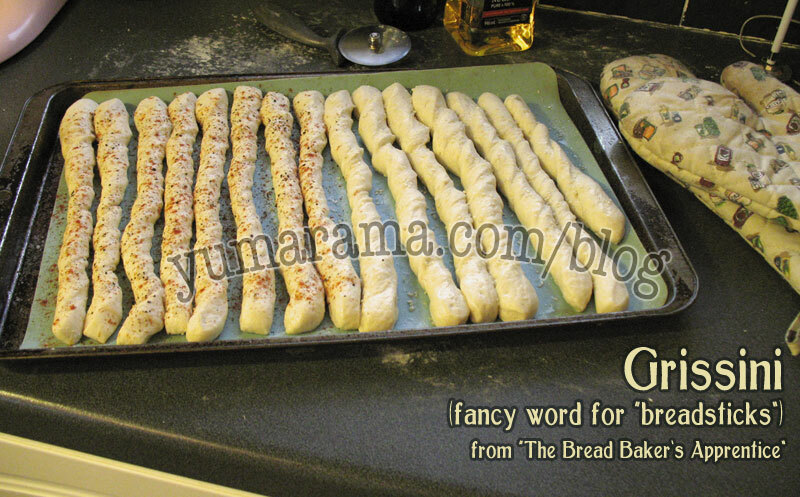 Once the Italian Bread was done, I lowered the temp and popped the Grissini in for a longer bake at 350ºF – I wanted crispy breadsticks. Hey, can you sport the mistake in the pan above? If you guessed “Holy crap, are they close enough together, you think?”, you’d be right. I should have put this lot on two sheets with more space between. But I didn’t, not right away, anyway. So after they were in the oven for just a minute or two and started to get a little oven spring, they all were touching and turning into one large sheet of bread. So out they came, I took the pizza wheel to them again and tried as carefully as I could to split them apart. I did OK, but they would have been happier spaced properly to start with. One more note to self for next time. Oh, by the way, did you know I almost always upload larger versions of these main photos? Click on the pic to see the bigger version. The bowl of soup (or chowder?) in there is some completely awesome Cream of Chicken Soup Mark made the day before, all from scratch. You can get it on recipeZaar.com if you want reaaaaly good, hearty soup. 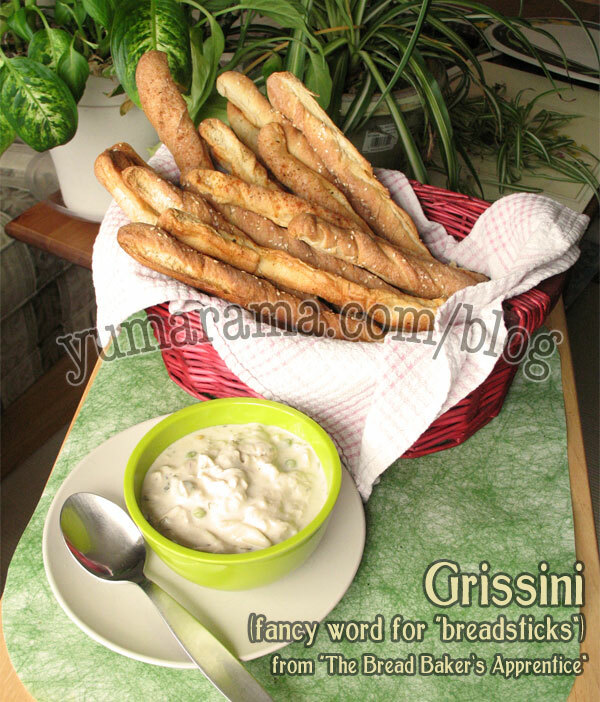 The Grissini, which I had with the soup once the “photo shoot” was over, was perfect. Crispy, not too too dry and tasty. They still look really good in spite of the emergency surgery. I left them to bake for about 15-20 minutes at 350º, as I said, you can get soft Grissini by baking at 400-425ºF for a shorter period, maybe 8 – 10 minutes, just keep an eye until they’re nice and golden then take them out right away. Tiny little soft loaves. The large Italian bread came out a little dark – probably more issues with the oven temp not being accurate. The photo makes it look darker and a little burnt but it’s just very dark brown in reality.